The soccer-with-cars phenomenon Rocket League is one step away from being the first game ever to bridge multiplayer between Xbox One and PS4 players. The catch? Developer Psyonix needs to the ol' thumbs-up from Sony before it can go live. We've known for while that Psyonix had the know-how to get the two consoles playing together, but now the concept is a reality - one that's just waiting for Sony higher-ups to pull the trigger. 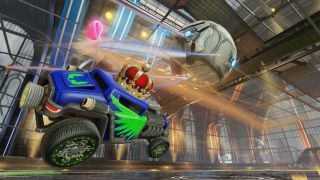 Should cross-play get the necessary approval, Psyonix's Vice President Jeremy Dunham tells IGN that it could get the two consoles talking to each other in less than a day. "It'd literally take a few hours to propagate [cross-console play] throughout the whole world," says Dunham, "so really, we're just waiting on the permission to do so." Currently, Rocket Leaguers on PS4 and Xbox One can each compete with PC players, but not against each other. Earlier this year, Microsoft showed an interest in opening up the Xbox One to cross-network play with other consoles, which seems to indicate that the company has already given Psyonix its blessing. "We're still very confident that [Sony's] eventually going to open those doors and welcome us in, but we also are really understanding that it's going to take a while, especially given all the ramifications of everything," Dunham says. Sony is open-minded to cross-console play as well, but has yet to take a firm stance, which is understandable, since opening up your online network to some other company's console isn't a decision one makes lightly. We've asked Sony for comment, and will update as new information comes in.